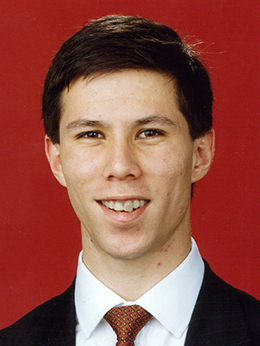 Bill O'Chee was an unconventional parliamentarian: at twenty-four years of age he was the youngest person to sit in the Senate, the first with Chinese ancestry to be elected to the federal Parliament, and he was an Australian representative in world championship skeleton races, an extreme one-person form of bobsledding. O'Chee sometimes sported a bright pink tie and drove an expensive Lotus Elise sports car painted the same racing green as his bobsled. William George (Bill) O'Chee was born in Brisbane on 19 June 1965, the eldest of three children of Chinese-born William O'Chee and his wife, Australian-born Theresa Josephine, née O'Brien. According to family lore, the paternal surname came about as a result of a misunderstanding: when Bill's grandfather Lau Oh Gee arrived in Australia in the late 1930s, accompanied by his son, an immigration official wrote his family name as O'Chee. Bill's father established a transport, retailing and trading business in Glen Innes, New South Wales, before moving to Brisbane where he met his wife, who was of Irish ancestry. When Bill was growing up, the family regularly ate Chinese food, cooked mostly by his father, and they celebrated Chinese New Year. The O'Chee house contained 'lots of little statuettes, gods and goddesses'. Despite this immersion in Chinese culture his father opposed Bill's desire to learn Cantonese, and insisted that he speak only English. He did this with such proficiency that as a grade six student he won an independent primary schools public speaking competition. At the age of twenty-one, he competed in world championship debating. Bill attended primary school in Brisbane and Surfers Paradise. He received his secondary education at The Southport School on Queensland's Gold Coast (1976–80), and Brisbane State High School (1980–82). At The Southport School he published his own royalist newspaper and sold it to his fellow pupils at five cents a copy. While at a school camp near Springbrook in 1977, O'Chee spotted a Yowie. At the time, he described the creature to the local Gold Coast paper: 'About 20 of us saw it ... It was about 3m tall, covered in hair, had a flat face and walked to the side in a crab-like style. It smashed small saplings and trees like matchsticks as it careered through the bush'. Nearly three decades later, O'Chee remained convinced of the Yowie's existence. At Brisbane State High, O'Chee won a scholarship to Oakham School in Rutland, England (1982–84). On completion of his secondary schooling, he went up to Oxford University where he read Jurisprudence at Brasenose College, graduating BA (Hons) in 1987. In his last year at Oxford, he was coxswain of the university's lightweight rowing crew. He was also a member of the university's Conservative Association. He reported that at Oxford he acquired 'The Dingo' as a nickname because his rowing colleagues 'reckoned I had the cunning and ruthlessness of a wild dog'. At the same time he discovered that 'law bores me senseless' although he did enjoy insolvency law, which he practised when he returned to Australia upon graduation. He went back to England in 1988 where he worked for the Libra Bank, which specialised in trading in Latin American debt. Acknowledging that this was 'a very niche area of the market', O'Chee found it 'good fun' and continued working in the area upon his return to Australia in 1990. As a fifteen-year-old, O'Chee had joined the Young Nationals. Since childhood he had been interested in politics—preferring news to cartoons on the television, according to his mother—and developing an admiration for Queensland's Premier Joh Bjelke-Petersen at the age of eight. He was also inspired by Sir Bruce Small, a millionaire Gold Coast businessman, mayor and Country/National Country Party Member for Surfers Paradise (1972–77) in the state Parliament. In April 1990 O'Chee was nominated by the Nationals to fill a casual vacancy created by the resignation of John Stone. Despite the fact that he was 'no bushie', arrived late and had not prepared a written speech for the selection panel, O'Chee gave what a party official described as an 'outstanding presentation' and was 'very confident, articulate, clear and concise'. After winning the nomination, O'Chee recalled that 'the first thing that struck me was this immensely hollow feeling ... You suddenly realised there was this enormous task for which you'd just signed on'. O'Chee had little time to find his feet. On 8 May the Queensland Parliament chose him for the casual vacancy, and on the following day, just ten days after being nominated, he was sworn in to the Senate. He delivered his first speech to the Senate less than four hours later. After acknowledging his Irish and Chinese ancestry, O'Chee addressed environmental, economic and youth issues. He urged the adoption of policies of 'sustainable growth' with constant focus on 'our long term economic future'. High levels of foreign debt under the Labor Government represented 'a disembowelling of the economy as money is ripped away from the pockets of ordinary Australians and put in the hands of people with no long term interest in this country'. He was equally critical of high interest rates which denied business 'a chance to breathe'. In order to provide the flexibility necessary for economic recovery, he advocated voluntary employment agreements. O'Chee observed 'a growing despair amongst young people', arguing that 'it is shameful that it pays better to be on the dole than it does to be a student on Austudy' and that tertiary education should be understood as 'an investment in the future of this country'. The speech ended with a call to Australia to 'harness the powerhouse of young people who are ready to fight for its future'. Because of his impressive personal attributes, O'Chee was seen as a potential minister in a future Coalition government, but this did not come to pass. Although he was elected in his own right to the Senate in 1993, the ALP held office until 1996, and O'Chee was defeated at the 1998 election without moving beyond the backbench. He served as the Nationals' Whip in the Senate (1993–99) and served on a number of Coalition policy committees. He was considered a 'very valuable' member of several Senate committees, including as chairman of the Standing Committee on Regulations and Ordinances (1996–99). The committee's role in scrutinising delegated legislation and ensuring that it did not trespass unduly on personal freedoms suited O'Chee's ideological disposition, but it was rarely the stuff of newspaper headlines. The committee's 1996–97 annual report gives a sense of the volume of work. In that year the Committee scrutinised 1791 instruments and sought and received formal advice on 165 of these. Scrutiny could sometimes be prolonged. In the case of the Orders establishing Comcover, the Australian Government's general insurance fund, there were nine months of extensive correspondence and meetings between the relevant parties before the Committee's concerns were satisfactorily addressed. During 1999 valedictory addresses, the Liberals' Senator Ellison recalled that O'Chee 'was not averse' to telling the Coalition Government 'when he thought a regulation transgressed certain rules, precedents and conventions'. On the same occasion, the Liberals' Senator Crane remembered O'Chee's 'outstanding' contribution to the 1997 Commonwealth Conference on Delegated Legislation. O'Chee delivered a paper to the conference, arguing that the Howard Government's Legislative Instruments Bill 1996 contained 'provisions which would derogate from the proper role of Parliament' and 'bring a smile and a nod of recognition from Sir Humphrey Appleby'. O'Chee's knowledge of Senate procedure was described as 'second to none' and he was a temporary chairman of committees during 1993. My grandfather, who was a republican in China and supported the KMT [Kuomintang], suddenly found, having got his republic, that he did not get the republic he wanted. And this is one of the great dangers. So it was to Australia that our family fled, to enjoy the freedoms that this nation has to offer under the provisions of our constitution. While he said 'it wasn't something I set out to do' and 'I wasn't going to be a token Chinese', O'Chee nonetheless accepted a role as a representative of Chinese-Australians. He drew on his family's past in political debates and in 1994 told the Senate that 'All Chinese Australians should be proud of the contribution their community has made to the building of our nation'. He spoke passionately against the 1989 Tiananmen Square massacre on a number of occasions. Yet his public statements on Chinese students in the wake of this appear contradictory. He argued that the Hawke Government was 'unfair and unjust' in ruling out immediate granting of permanent visas, yet called for the English Language Intensive Course program—under which many Chinese students had been admitted—to be scrapped, claiming it had become 'the soft underbelly of migration' to Australia. He later said that the question of permanent residency for Chinese students should have been decided 'on a case-by-case basis'. In 1992 he declared that Chinese and Cambodian boatpeople who were 'economic refugees' should be sent back. O'Chee placed great emphasis on obtaining 'quality' migrants who could contribute to the economy. In an interview published in late 1990 O'Chee was reported as having 'strong views on immigration. He hates the term multiculturalism, which he says places too strong an emphasis on our diversity and not on the fact that we should be one nation'. Nearly three years later, he told the Senate that migrants should 'make an unswerving commitment to this country, to our constitution and to our head of state ... we have a right to determine who comes here'. Despite his cosmopolitan background, O'Chee made it clear that he represented rural and regional Australians. Speaking on the Native Title Amendment Bill 1997, he argued that the most significant divisions in Australian society were not between black and white but 'between those who live in the cities and close to the cities and those who live outside the cities'. In the wake of the High Court's decision in the Wik case in December 1996 O'Chee demanded the complete extinguishment of native title on pastoral leases and threatened to leave the Coalition unless it agreed to his position. He justified his stand by pointing out that farmers and graziers 'have paid for the land they occupy; they have worked it and improved it', and by reference to 'the anger and resentment that exists amongst Australians in the bush [that] will continue and intensify if we persist with the notion that two different groups of people can have title to the same piece of land'. The release of Prime Minister Howard's Ten Point Plan in April 1997 sparked several months of heated negotiations between the Coalition partners; there were also disagreements among the Nationals themselves. Eventually, O'Chee accepted a compromise that did not include total extinguishment of native title, arguing that what was offered in the amended Native Title legislation at least provided 'certainty and a framework', and he urged passage of the measure 'to ensure that we have one united and harmonious country'. This was not the only time O'Chee found himself at odds with his party or Coalition colleagues. He clashed publicly with National Party leader Tim Fischer in 1992 over the proposed reduction in the sugar tariff (which O'Chee and other Queensland Nationals opposed). In 1998 O'Chee sided with the Liberals but against his own party on the privatisation of Telstra. Facing threats of disendorsement on this issue, O'Chee was unworried: 'I have got much better things to do with my life. I don't need to be a senator'. While his views on multiculturalism, citizenship and migration were conservative, O'Chee made one of his strongest stands in opposition to the racial views of Pauline Hanson, who was elected as an Independent for the Queensland seat of Oxley at the federal election of March 1996. Hanson had expressed hostility towards Asian immigration, prompting O'Chee to recall how as a child he had faced racial prejudice, receiving taunts of 'ching chong Chinaman' and 'two wongs don't make a white'. In the Senate and in the media he recounted his childhood fears of racial abuse and intimidation and, speaking for Asian-Australians, reminded those assembled that 'This is our country; it is our precious homeland in which we were born, in which we were nurtured, and in which we strive to live in freedom and in peace'. Together with Senator Ron Boswell, O'Chee was one of the few National Party politicians to directly attack Hanson's One Nation party, formed in 1997. Initially, he had discounted the possibility that One Nation might take votes from the Nationals, but One Nation's startling success in the Queensland election of June 1998, where the party (with the help of Coalition preferences) won eleven seats, provoked a forceful response from O'Chee. He spoke vigorously against One Nation's plans to create a 'fortress Australia' and argued 'that the greatness of our nation should not be hidden behind walls of fear and self-doubt'. In the lead-up to the federal election later that year, he urged the National Party not to give preferences to One Nation. It was ironic therefore that he was the only victim of One Nation's foray into federal politics when he lost his Senate seat to a One Nation candidate, Heather Hill, at the election held in October 1998. Subsequently, O'Chee mounted a legal challenge, which resulted in Hill being declared ineligible to stand for election, by the High Court, sitting as a Court of Disputed Returns, on the ground that she had not renounced her British citizenship. However, a recount of the vote did not return O'Chee to the Senate: Len Harris, the second candidate on One Nation's Queensland ticket, won the seat. At the end of his political career, Senate colleagues paid tribute to O'Chee's powers of oratory—including his rare capacity to speak without notes—his 'clarity of thought' and his 'analytical appraisal of issues'. O'Chee himself ranked his involvement in a court case which clarified the scope of parliamentary privilege as his 'greatest victory'. In O'Chee v Rowley (1997), a case connected to defamation proceedings brought against Senator O'Chee over the content of a radio broadcast, the plaintiff in the defamation case wished to gain access to documents, including communications from O'Chee's constituents, which the senator had utilised when making his on-air remarks and in the Senate. Drawing upon section 16 of the Parliamentary Privileges Act 1987, O'Chee asserted that the documents 'were created, prepared, brought into existence or came into ... [his] possession for the purposes of or incidental to the transacting of the business of the Senate'. The Queensland Court of Appeal ruled in his favour, finding that if such documents were used in the transaction of parliamentary business, they were protected by parliamentary privilege. Justice McPherson stated that if Senator O'Chee was required to produce the documents, 'Proceedings in Parliament will inevitably be hindered, impeded or impaired if members realise that acts of the kind done here for purposes of Parliamentary debates or question time are vulnerable to compulsory court process of that kind'. In the years after O'Chee's departure from the Senate, newspaper articles portrayed a turbulent life that included separation from his wife Tara Gail, née Symons—whom he had married in April 1998—and their two children, allegations of indebtedness, the birth of a third child with a new partner, and his involvement in a range of business enterprises. His parliamentary achievements were overshadowed by the attention paid to his life pension of $45 000 a year, which he was able to draw from his parliamentary superannuation fund while still in his early thirties. The superannuation scheme was amended in 2001 to ensure that any parliamentarian elected at the next general election or thereafter would not be entitled to receive a parliamentary pension until the age of fifty-five. In late 2000 O'Chee took 'a very difficult decision' to join the Liberal Party in protest against the decision made by many National Party candidates to preference One Nation ahead of Labor in the February 2001 state election. He then unsuccessfully sought pre-selection in the safe Liberal seat of Moncrieff for the federal election in November of that year. After this, he remained in the background as a member of various Liberal Party campaign teams, including as manager for the unsuccessful Liberal National Party candidate for the seat of Ashgrove at the 2009 Queensland election. In June 2010, O'Chee announced that he was considering standing for pre-selection in the newly gazetted, and notionally Liberal, federal seat of Wright, but ultimately he was not one of the eight candidates on the preselection ballot. In 2011 O'Chee alleged that he had been approached by a News Ltd executive in 1998, and promised favourable coverage if he crossed the floor to vote against the Television Broadcasting (Digital Conversion) Bill 1998. News Ltd denied the allegation, and the Australian Federal Police investigation was dropped due to a lack of evidence. Much of the biographical information in this entry was drawn from the following sources: Diana Giese, Astronauts, Lost Souls and Dragons: Voices of Today's Chinese Australians in Conversation with Diana Giese, UQP, St Lucia, Qld, 1997; Age (Good Weekend) (Melb. ), 4 July 1992, p. 28; The Bulletin (Syd. ), 20 May 1997, pp. 22–3; International Herald-Tribune, 8 Aug. 1994, p. 2; Gold Coast Bulletin, 1 Jan. 2005, pp. 35–6. SMH, 10 May 1990, p. 4; CPD, 9 May 1990, pp. 149–53, 6 March 1997, pp. 1403–7, 24 June 1998, p. 3988, 27 May 1999, p. 5526, 24 June 1999, pp. 6409–43. CPD, 25 Oct. 1995, p. 2468, 31 May 1990, p. 1556, 4 June 1992, p. 3519, 10 Nov. 1994, p. 2951, 29 Sept. 1993, p. 1419, 27 Nov. 1997, p. 9606; Age (Melb. ), 14 June 1990, p. 20; Media Release, Senator Bill O'Chee, 27 June 1990; Giese, Astronauts, Lost Souls and Dragons, p. 114; Sun-Herald (Syd. ), 3 May 1992, p. 29; Age (Melb. ), 24 Dec. 1990, p. 7; Australian (Syd. ), 2 May 1997, p. 1; Transcript, ABC Multimedia, 'Frontier', 13 March 1997; Age (Melb. ), 25 July 1998, pp. 4–5, 16 July 1998, p. 1. Daily Telegraph (Syd. ), 1 Nov. 1996, p. 42; CPD, 30 Oct. 1996, p. 4752, 24 June 1998, p. 3938, 24 June 1999, pp. 6417, 6420; Newcastle Herald, 26 June 1999, p. 9; Sally Walker, 'The Courts, Parliamentary Privilege & the Media', University of Technology Sydney Law Review, Vol. 1, 1999, p. 159; Enid Campbell, Parliamentary Privilege, Federation Press, Sydney, 2003, p. 16; Australian (Syd. ), 19 Jan. 2002, pp. 1–2; Sun-Herald (Syd. ), 11 Oct. 1998, p. 59; Transcript, ABC Radio, 'AM', 3 March 2001; Australian (Syd. ), 26 Nov. 2012, p. 6. This biography was first published in The Biographical Dictionary of the Australian Senate, Vol. 4, 1983-2002, Department of the Senate, Canberra, 2017, pp. 228-232.